Hello Pro’s. 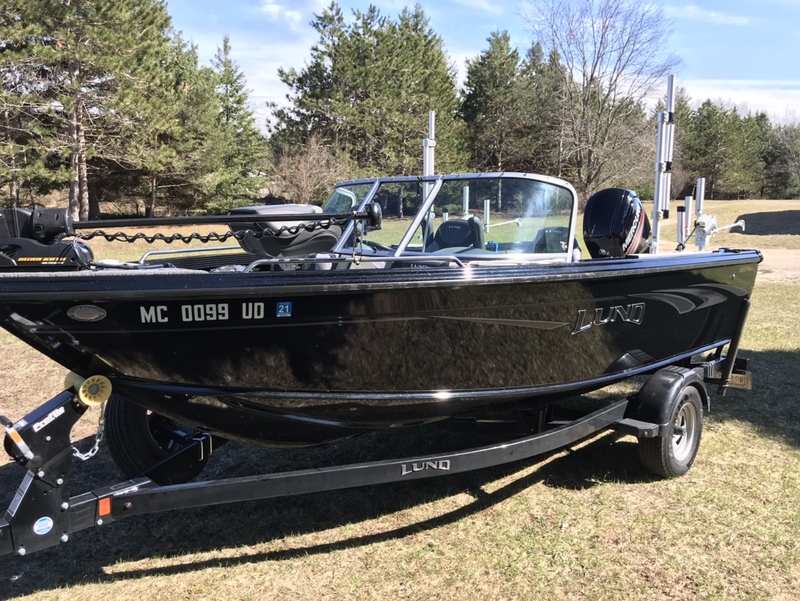 I have a 2018 Lund Tyee with the 42 degree Sport Track system. Last spring/summer I trolled with cheap plastic rod holders for dipsies and leadcore. I had a ball. My wife had a ball. We actually found something that we both enjoy and we were getting pretty good at. 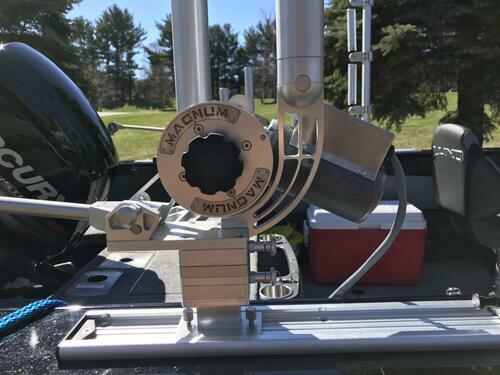 I have saved all winter for downriggers and rod holders to make trolling and rid management easier and make the bot a little more professional looking. I am ready to make a huge purchase but wanted to voice my concerns and see if you guys will guide me in the right direction. My gut feeling and current path forward is to buy Big Jon Pro Pro Tournaments affixed to the Lund Sport Track downrigger plate. The silver finish and the autostop are the sell points for me. This will also give me the ability to move the downriggers up and back, and remove them on overnighters. I have seen zero reports of the Lund Sport Track not providing solid support. Let me know if I am making a mistake. 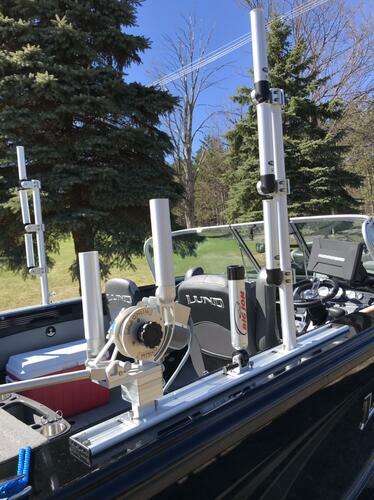 My second purchase is Big Jon vertical rod trees (the three rod holder) on the Lund Sport Track downriggers plate. The one hand operation is the sell point here. My concern is...Do you guys run dipsies on these vertical rod holders? I am kind of worried about the strength of the tree especially at the top. Seems like my dipsies are beastly pressure. My other purchase is to by the TX-44 Church Magnum Planer boards for dipsies. Do you guys use planer board with dipsies? I like the big boards for lead core, but never used them for Dipsy divers because I thought the diver would just pull the board under or the board would just come off. Thats quite a lot to digest, all responses appreciated. Target date for purchase is 5 March for all the gear. Thanks Mega Byte. Yep, the consensus is no dipsies under planers. It felt odd to me when I read about that, but the product description for the magnum sized planer board includes dipsies. They must be talking about the little divers. Yes, this is quite a “build out” for the new boat. If it wasn’t such a rush bringing in those silver fish (lakers included), I would just go with what I have. But trolling has really been much more fun than I expected and my wife is hooked as well. So, I feel good about blowing cash on this. Got a nice tax return due to the increase in the standard deduction, so that encouraged me to start closing loose ends on my questions. 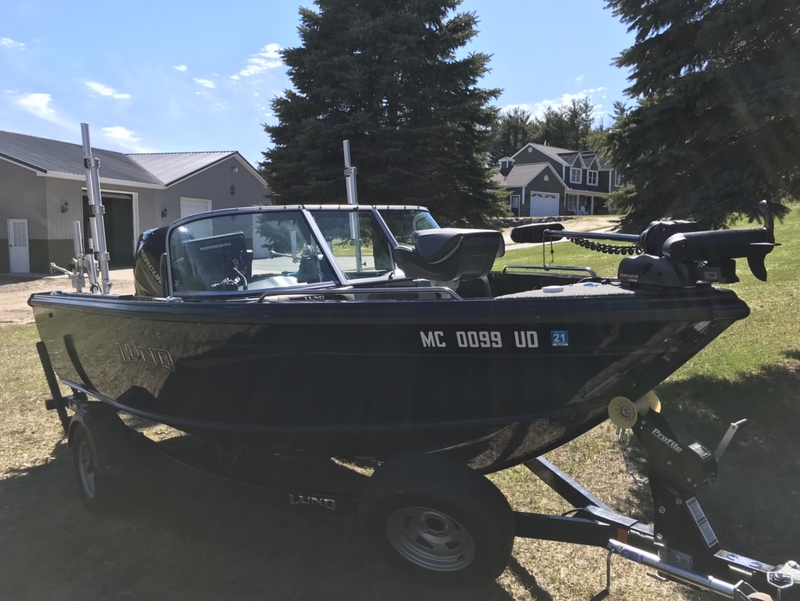 I run a Lund 1750 rebel with the same sport track. My advice is to look into a track system such as Cisco or traxstech. I ran traxstech tracks and vert tree last year, and just bought berts ratecheting holders this winter for my dipsys. I run my riggers, which are walkers, off my tracks in a traxstech swivel base. The nice part of the track system is I can move things around to suit my needs. Also, adding new holders doesn’t require the purchase of new bases. My first season for salmon was last year and I learned a lot. Mainly, dipsy rods put a ton of strain on the trees. I did a lot of research prior to setting up my rig and what I found was most people prefer to run a track vs mounting directly to the sport track itself. Hope this helps and good luck. Thanks Mfitz. 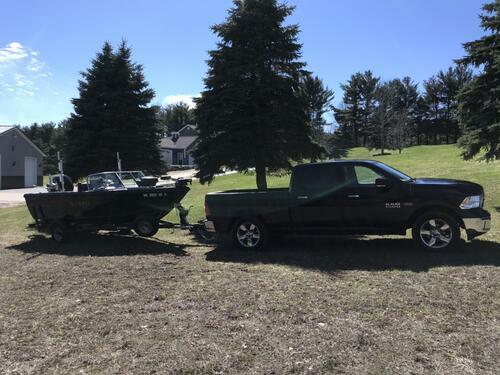 You are on the side of going with tracks and I may do that after I use what I already have and what the boat came with. I am going to begin this setup using the Lund sport track. The Cisco mounts (that I have already) for a single tube holder will work for a triple tree (horizontal) rod holders, and the Lund downrigger mounts will work for the downriggers. If I feel like I want to drill holes and use tracks for more support, Traxtech, Berts, and Cisco will all be price competed (of course). I have a meeting with Big Jon HQ this week to discuss my plan and purchase from them if they will get close to other internet prices. You should look at Great Lakes Holders for your divers. They are best for divers because they lock in the down the position but you can always pull the holder up and in when a fish hits. This makes it easier to get the rod out of the holder, especially when it's a big king and you don't have to extend way out from the gunnel to get it. They are extremely durable and your diver holders take more stress than any other rod holder. Thanks EdB. Their website is scant on details and no you tube videos on GLH at all. I see a lever on their rod holder, (revolving banner pic on their homepage)which tells me these rod holders are not a “one handed” operation. Prices are even more than the Traxtech holders (the most expensive). I gave them a look, but I’ll pass. Thanks again. I have triple trees. Custom made, welded construction, ss pipe. (Retired pipefitter style) I only run one set of divers, one each side. My trees are mounted further to the stern than most. I use the bottom holder for wire divers. Works for me. I went with Scottie riggers. I like the free fall out, control the speed with a brake. Some like the speed, I did not like the down motor of my Big Jons. It seemed like every month or so the cable would bind and start to raise the ball as it wound on backwards. A dandy big kink in the cable. Maybe a 15 pound weight would have prevented that. Thanks Youp. I am headed to the Grand Rapids Sport Show next weekend to meet the Magnum Metalz guys...so yes, I am being researched to death and the lure of many downriggers have come and gone. Will keep you posted on what I end up with- pics will come as well. Magnum Metalz look good but very expensive. I ran Cannons for 25 years with a variety troubles. Switched to Scotties in 2013. No troubles no regrets. My HO. Thanks Mike. I priced all. 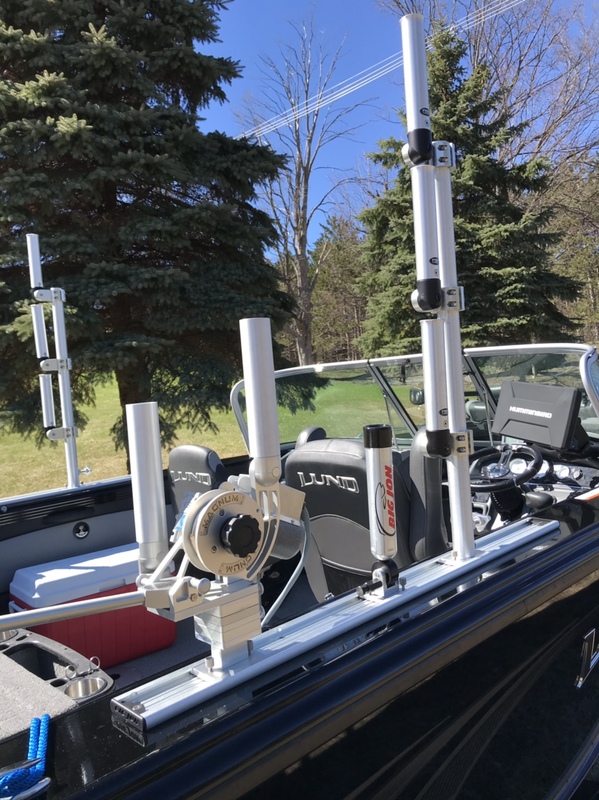 For the “aluminum/stainless” downriggers (Big Jon, MM, Ciscoes, and Traxtech) and when I list out comparable functions (autostop, motor speed/size, and cable length (300’), and two multi-axis rod holders, Magnum Metalz scored higher in features and price. Cisco and Traxtech were more expensive, but have added features that were not important to me (programmable keypad, jigging action). The Cannons and Scotties were definitely the most common and the most recommended as well. This weekend is the big dollar spillage for me after I see the gear at the Sport show. For Downriggers I went with the Magnum Metalz 2500 (2-rod holder). The MM’s key features for me were the autostop clutch, the 200 FPM motor, the 300’ of cable and the swivel base. The price for this was way cheaper than comparables (BJ, Cannon, Scott and the gold plated Traxtechs). Now for the bad part. Mfitz was right. 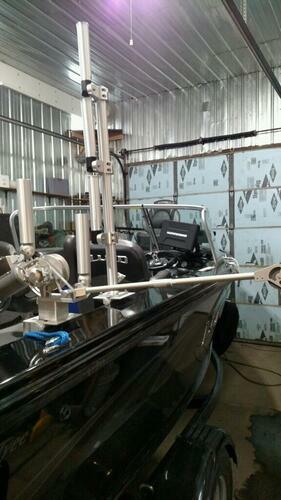 The Lund Sport Track Downrigger Mounts will not work. A lot of slop. Photo attached. I have a video, which is better than the photo, but now way to upload it. I have already ordered 4’ track systems for each side and am emotionally prepared to drill holes in my brand new boat. Hard to say that. Magnum Metalz 2500 series Downriggers. Fish On Triple Rod Tree with Net Holder. After much installation and testing on the water and bumpy dirt roads, this was the “heaviest dutiest” setup I could come up with (both solid to the gunnel, and solid in its own design). I was balancing price versus quality. Thanks RedRider. I am picky, but only wanted to do the rigging once I am very happy the way it turned out. Thanks Mike. Hopefully it will last my lifetime.